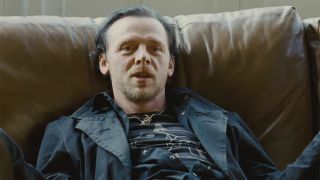 Pegg in The World's End. Gamers, geeks and '80s nostalgia lovers are all eagerly looking forward to the arrival of Ready Player One on cinema screens in March 2018, and the film's producers have just added a new actor to the cast, Variety reports - British star Simon Pegg of Star Trek, Mission: Impossible, Shaun of the Dead and Spaced fame. Adapted from Ernest Cline's 2011 novel, the movie is set in the year 2044 and follows the attempts of teenager Wade Watts (played by Tye Sheridan) to unlock the complex series of puzzles hidden in OASIS, a virtual reality world that many have come to prefer to real life. OASIS is the co-creation of Ogden Morrow, a benevolent engineer loyal to the world's original aims, and this is the character that Pegg is slated to play. His backstory has been compared to that of Apple co-founder Steve Wozniak. Both OASIS and the novel are packed with video game references, particularly classic console and arcade games of the 1980s and 1990s. With Steven Spielberg signed up to direct, it should be well worth the wait (the release date was recently pushed back to avoid any Star Wars interference). And it'll be topical too - with the likes of the Oculus Rift, HTC Vive and PlayStation VR all launching this year, next-generation VR worlds are just beginning to be established. We might have an OASIS of our very own by the time Ready Player One rolls around. Cline sold the film rights to his book a year before it was published, and he's taken on screenplay duties himself. Also confirmed as a cast member is Olivia Cooke (Me and Earl and the Dying Girl) who plays Wade's friend and ally Samantha Cook.